Before I start this part of the review, I’d yet again want to thank you all for appreciating the last post whole heartedly. Especially when I hear that you like the layman-ish take of the review, it indeed feels good and is a big compliment to the blog itself. Thanks again and keep supporting like this. 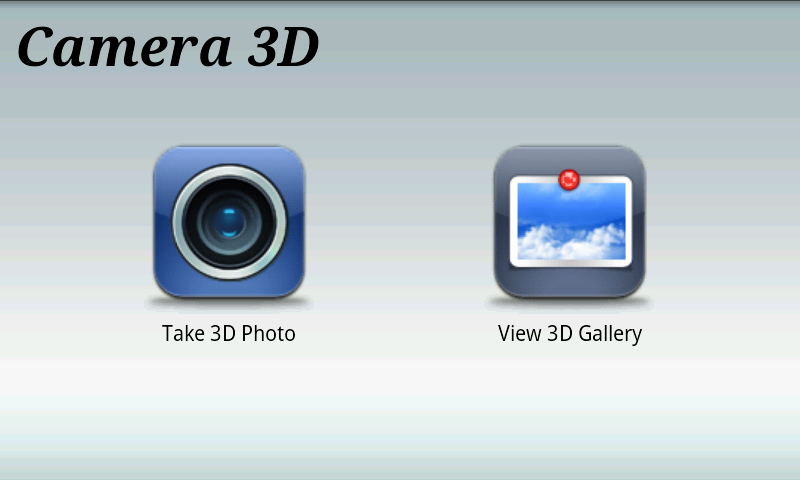 The 3D Photo Gallery of Android is really impressive. There’s so much in it that I could even write a full post about it. 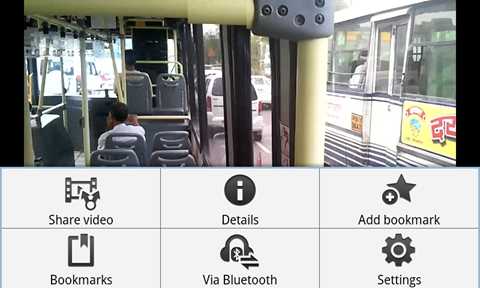 Picasa integration, effortless sharing (not only with the services but with various apps as well) are some of those features which make the Android Gallery stand apart from other platforms. How cool and fluid this interface feels like just can’t be put in words, and it can only be felt by using it with your fingers. As I couldn’t make a video myself, I’ve just added one from the web. (not from my Galaxy S). Once you are inside, there are a lot of innovations that take your attention instantly. 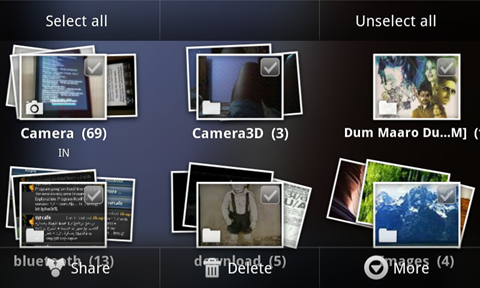 Consider the picture above, we’re inside the Camera folder. And now, tapping on the home icon will take you directly to screen containing all of them and that’s the same with sub-folders as well. On the top right, there’s a toggle button to change the view as per the timeline and location. The thumb friendly bar the bottom is used for scrolling and while scrolling, it also shows the date at which those snaps were taken, enabling you to get a clearer idea of the album you’re scrolling through at the moment. Though I have seen some older Android handsets struggling with very fast side scrolling of photos, but the Galaxy S has never experienced that problem. 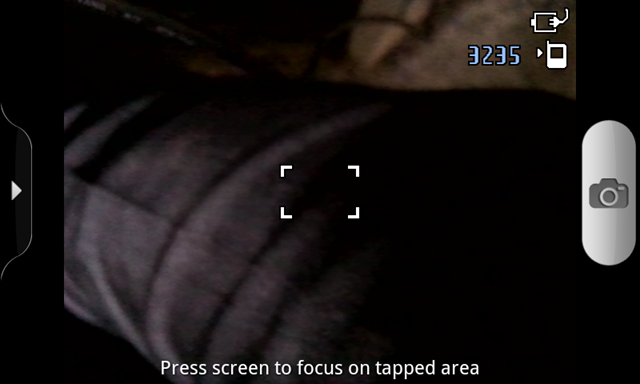 Pinch to zoom is really smooth through the whole operating system and apps wherever it is necessary and works very well. 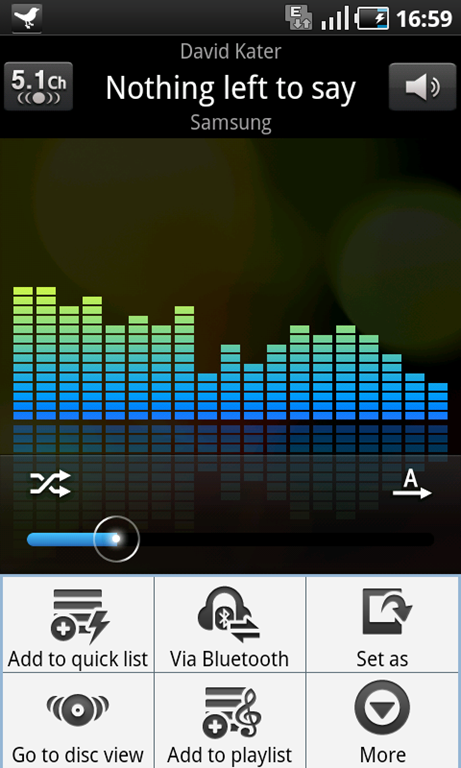 The biggest issue with the Android Gallery as of now according to me is the downsizing of images. 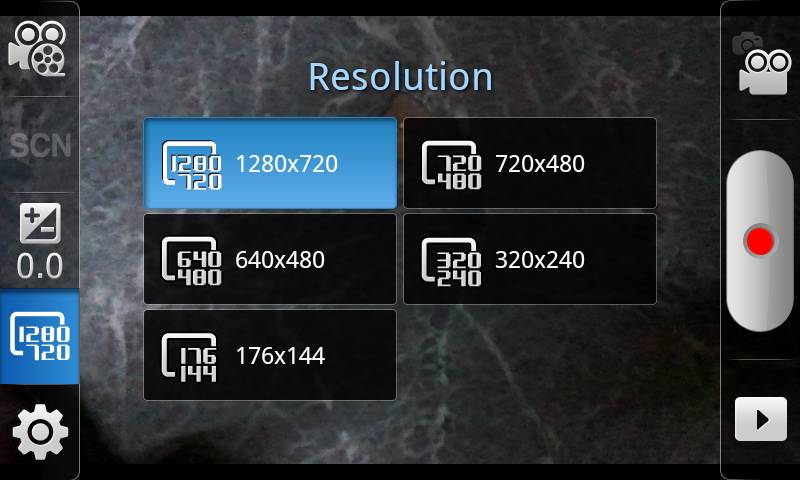 It shows the optimized version of images rather than showing them in full resolution. While this contributes to the performance of the 3D interface, I am not sure if this compromise is actually worth the resizing of pictures. Especially, if someone would zoom into pictures only to find pixels and instantly pinching the fingers back in disappointment. I hope it will be improved in the later versions as it should not be a big deal with the highly capable GPUs and Hardware Acceleration. Maybe I am a little spoilt because of the editing richness of Nokia phones, but yeah. 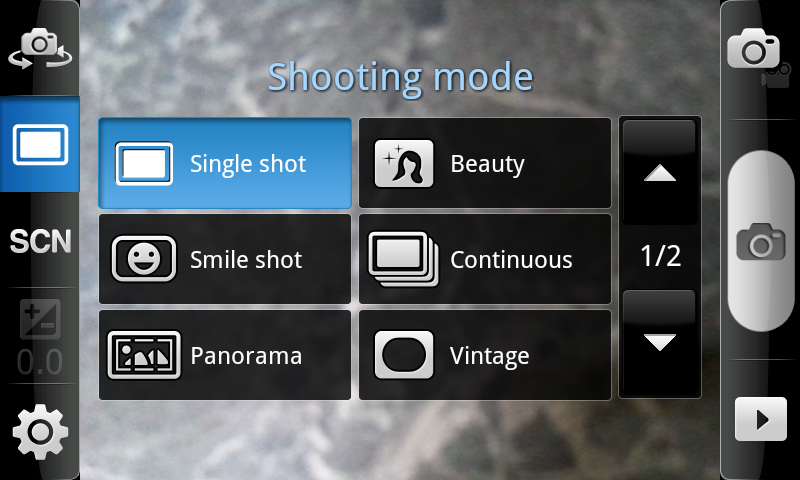 Editing(out of the box) is another feature I miss a lot on the Galaxy S. Though there are a few basic options, it’s not that even close to the richness I’ve seen on the Nokia N8. 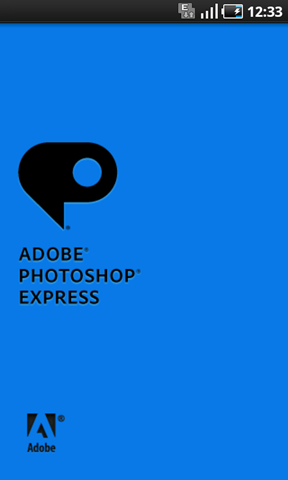 But on the other hand, Android never leaves you without some alternatives and when the alternative for the same is a big name like Adobe Photoshop itself, then you just can’t ask more. If only it was integrated. Though honestly speaking, I would say that even this slimmed down version of Photoshop doesn’t compete with the top notch photo editing options available out of the box with Symbian^3 phones and even older Symbians. 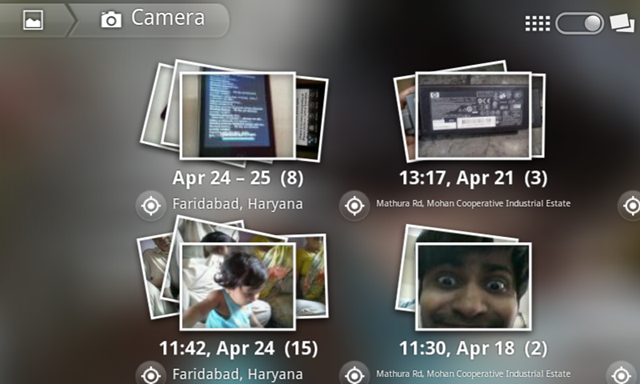 After living in the Symbian world all these days, there are many things which I’ve taken as granted. (but that goes for its limits as well) I strongly feel it would be better to consider everything afresh instead of comparing, assuming a first hand experience with the S. Many had asked me about the Loudness, Music player, Video playback, FM Radio, Codec support etcetera . 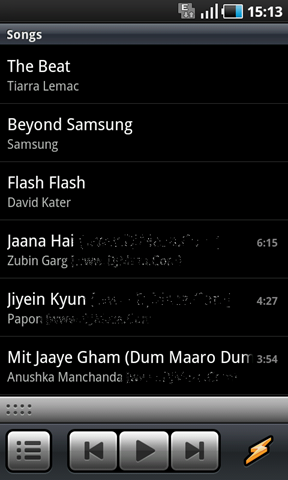 Though there are many more things about the multimedia experience on Galaxy S, but I always start from these basics only. I have seen many obsessed with the loudness of their phones, but real Audiophiles know that it does not even contribute to 25% of the experience. It’s technically impossible to include such a speaker that could rival the loudness of your desktop stereo nor would that have been a preferred solution. The Galaxy S might not be one those of best audio experiences out of the box, but the level of customizations that Android allows can really amaze you, if you know how to deal with it. 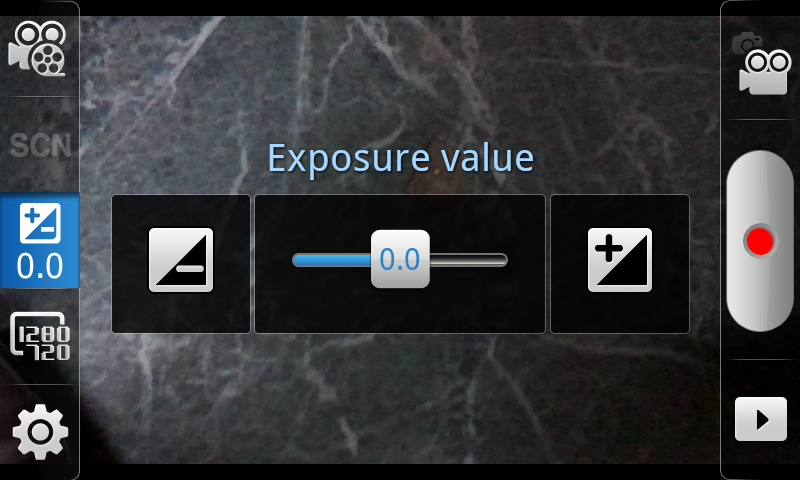 Check out the snap above and the options available via the default player on the Galaxy S, nice visuals and loads of options beneath. Though there is no Dolby sound here, you get 5.1Ch if you’re on headphones with Sound Effects and Equalizer both set to normal (instead of Auto). 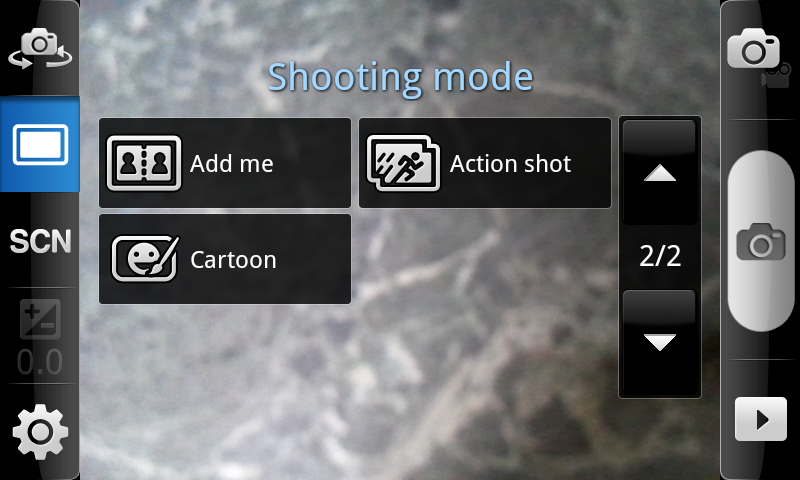 Also, check these snaps out to see some more options provides. 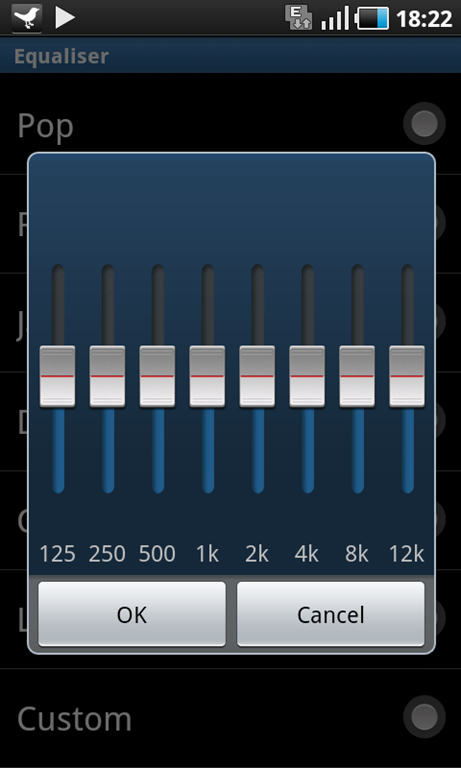 But when you dig into details, then it comes where Android makes you feel that what if Nokia N8 like hardware was having these kind of settings… (though one of the Nokia N8 mod adds custom equalizer). 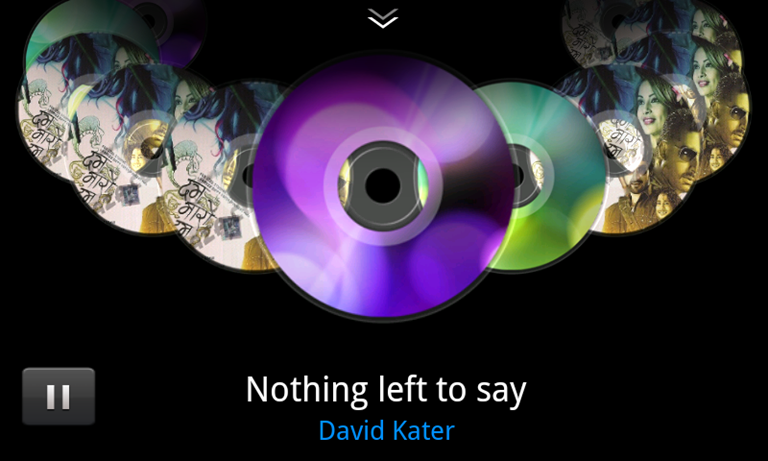 And if you wanted to see the design and intuitive interface of scrolling through albums, that’s neatly added too. After Apple’s Cover flow, every touch phone manufacturer has started including their own designs and interface for the same. Let’s see what Galaxy S does about that. Not sure about the tech behind this stuff, but Samsung decided to keep it simple. Each song is a disc, rotate the chain and tap the disk. 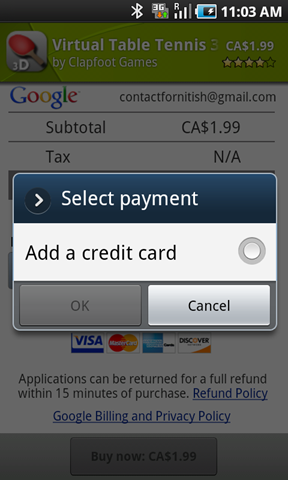 No turn around animations like iOS or a pop out page like Symbian^3. The name of the file is displayed in the bottom and it turns out to be pretty helpful. If you thought that was everything, then there is something unique to Samsung’s ‘TouchWiz as well. 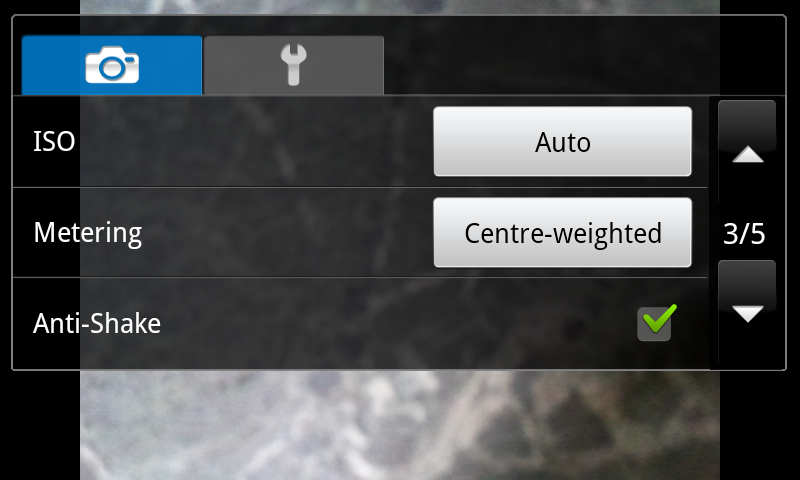 Just drag the top arrow key shown in top bottom of the disk view and you get the circular wheel view, the one you can see up there in the picture. Tap a word on wheel and the song will play. Tap ‘all’ and you can decide that what these words inside the disk will be; Playlist names, Album Names, Artist names or song names. 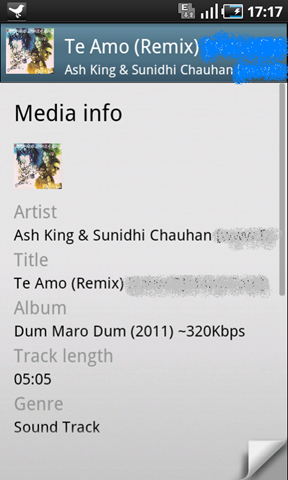 That’s the info screen which pops up when you choose a song’s details. Neat. 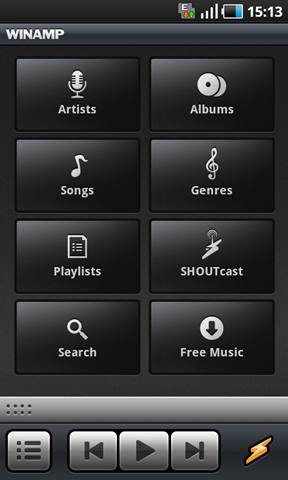 Also, there’s a really really big world of Android apps out there and there are many choices one can go for when it comes to their favourite music player or the app to sync with. I went ahead and got Winamp, the olden days’ PC favourite and here are a couple of snaps of the Winamp UI. It’s simple and neat with not much of transitions and works really well. The default video players of various platforms have been rarely making any excitement when it comes to media file browsing. Same old list of media files with some additional info and a small preview of media. I know that might be a little tougher with the resources at stake, but there might be some kind of coverflow animation or even the small alterations like how Vplayer shows them as shown in the screenshot here. If you look at the default video player closely, there’s a lot it brings for you actually. 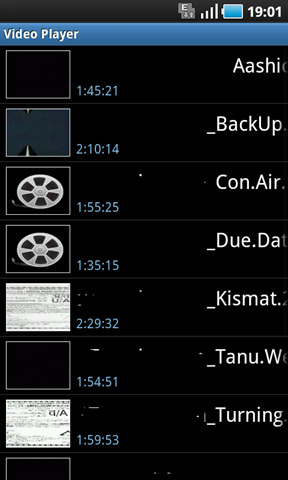 Thumbnail Preview(if its possible to play the file), Duration(shown in blue), File name(shown in big fonts) and option to list by Size, Name or Type. 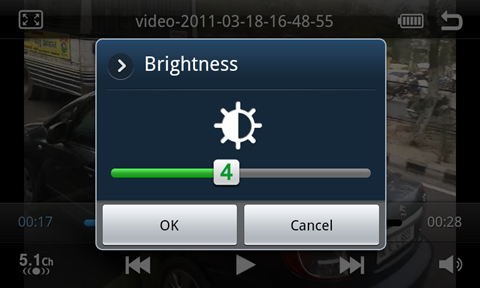 While, with Vplayer, you get bigger thumbnails and size mentions. (though not always correct) Also, with the native player, I’ve seen crashes in listing page when there are multiple heavy files and/or complex formats. But these issues are limited to the native player only and crashes are not at all frequent and to be honest, it never happened while playing a file. Must be some issues with list algorithm I suppose as I’ve tried multiple free players from the Android market and almost all of them functioned neatly while listing the same files. When it comes to the interface of the player, it’s simple, like most of the other platforms. 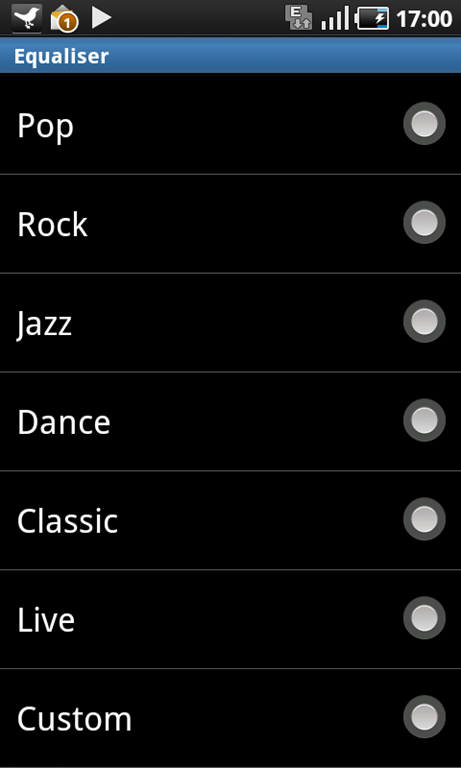 Though under options, you get more settings that makes it score higher over its Symbian and iOS counterparts. As you’ve seen them on the Music player, even the Video player doesn’t do just a formal job of it, but also provides a lot of built-in customizations options. 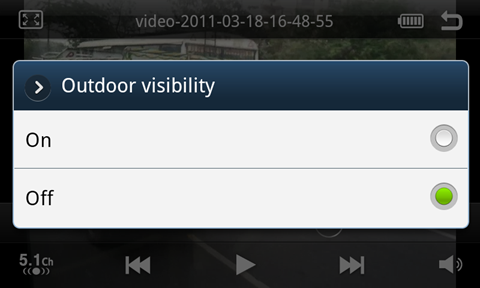 Especially, the outdoor visibility setting was an interesting one as it raises the contrast and brightness for outdoor viewing. For people knowing this stuff, it’s better to have some manual control over things than automatic settings. And coming to Codec support, Android being Open Source doesn’t disappoint you, at least with Galaxy S like capable hardware. You get out of box support for most of the formats though I faced issues with some of the mkv files but in most of cases, it plays all 720p formats smoothly. 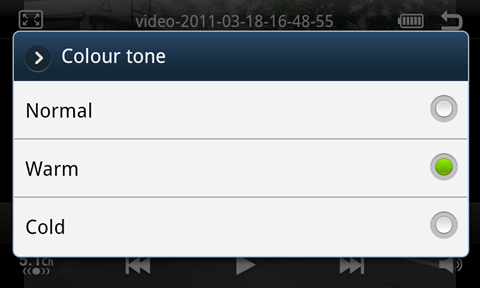 Though I’m yet to test that how it behaves with Full HD videos. 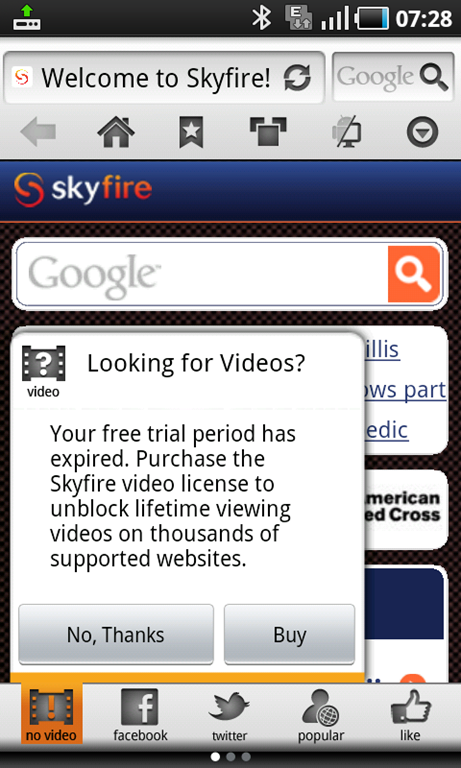 But loads of apps in the Android market, you can always get one and get your video playing. There is a VLC Player for Android in the making for quite a while and till that’s our, there are many free players out there in the market that do the job and some of the paid apps are excellent too. 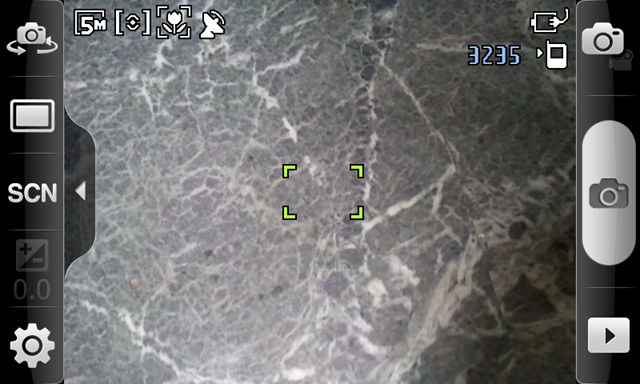 Honestly speaking, the camera part of this review has been something really hard, being a Nokia N8 owner. It really takes a lot of patience to explore other camera phones. Lack of Flash, lens cover and Gorilla Glass on the lens ruins the experience completely and that’s the initial impressions of the hardware if you’d ask me. But when you decide to live with it, then it’s a mixed bag of joy and sadness. Read through! So as you can see, though it’s minimalistic in the basic screen, it offers almost all that you could expect from a mobile phone’s camera. Nice additions are tap to focus and pinch to zoom for zooming into some particular area. Neat! I still am not totally satisfied due to the lack of a physical camera key here. Say, your hands are dirty and you want to take a quick close up snap of some object in hurry, would you touch the screen and mess it up? I still keep pondering over this. I’ve also heard of small hacks that can convert the power key into a camera key but that still doesn’t solve the issue of focusing on an object via some hard key. 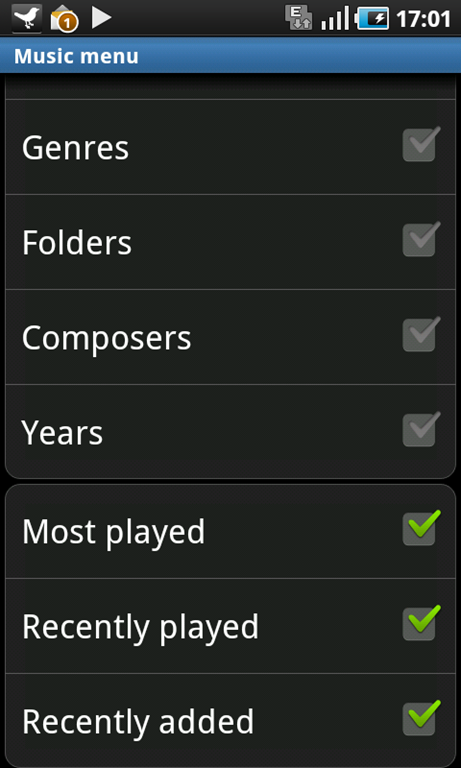 Yeah, the N8 has spoiled me a lot! 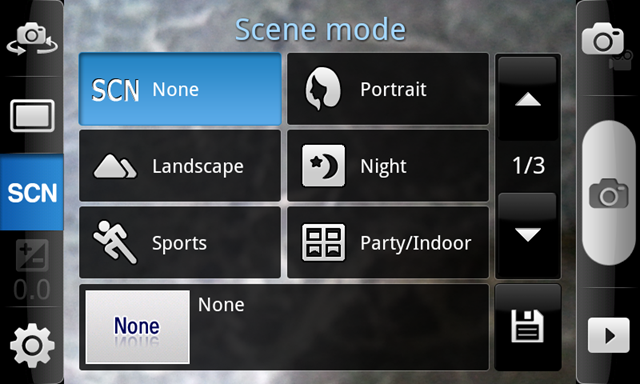 While there are many types of modes available in a neatly organised thumb-friendly manner, (than complicated menus and small buttons) it was strange not to find a traditional macro mode option out there. Though it automatically does so while snapping, honestly speaking, it was not even remotely efficient in comparison to my Nokia N82, leave alone the N8. Though when I used "Text Mode", then it was an very effortless job. Works well, but the ‘Macro’ mode as such is missing. 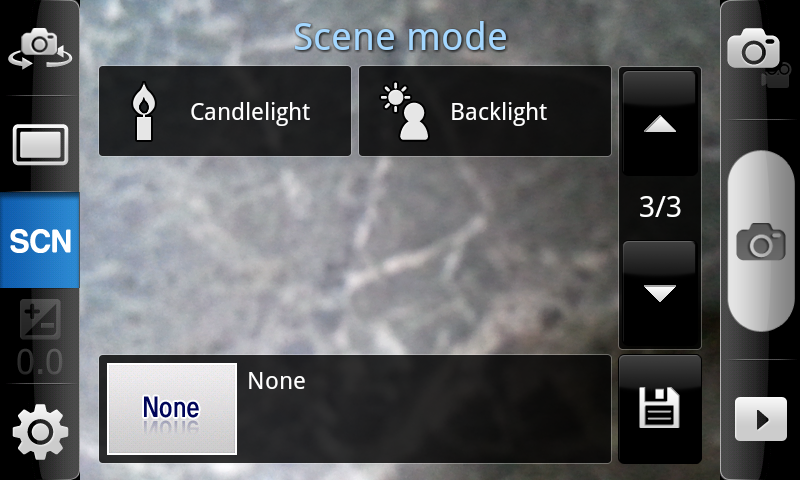 There are many scene modes available out there, but when they’re performing real time, I realized that the features such as smile detection are pure marketing gimmicks and nothing more. Not to forget, Panorama does a good job here! Apart from the visuals, there are sure some interesting levels of control over the camera hardware here as seen in the picture. I missed only one thing throughout, the top notch hardware. But the same hardware, which you thought was okay-ish suddenly becomes precious when you check out the video it does. 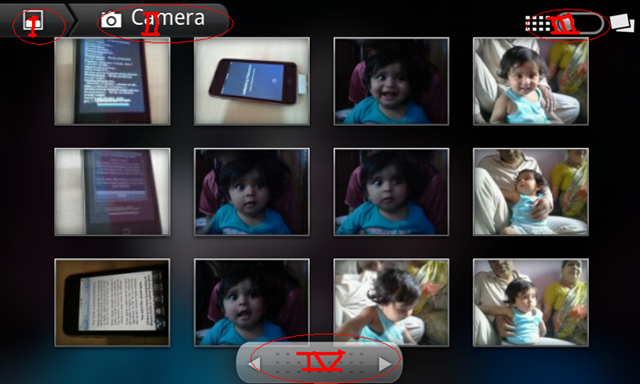 Under proper lighting conditions, the Galaxy S takes full advantage of the HD recording without any single glitch. Brilliant! 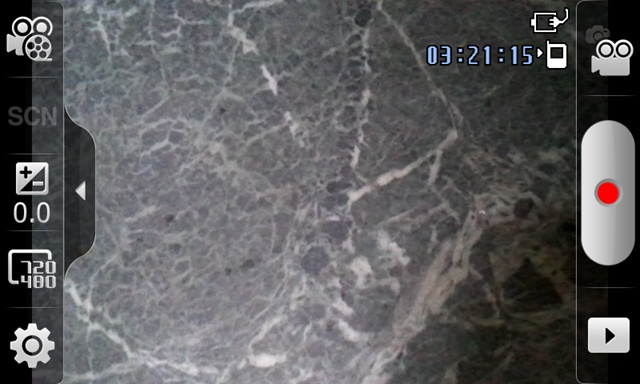 Check out the following HD Sample (720×480) and observe the smooth Continuous Auto Focus working superbly. So, while taking still shots, you might prefer other cameras over the S but for video shooting, the Galaxy S bounces back in at its best. And before I leave the camera part, let me remind you once again about the various apps you can get from the Android market which enhance your experience totally. Here’s a sample! Considering the number of alternatives here and also the performance of individual browsers, Android takes the topmost slot in market, when it comes to browsing content. 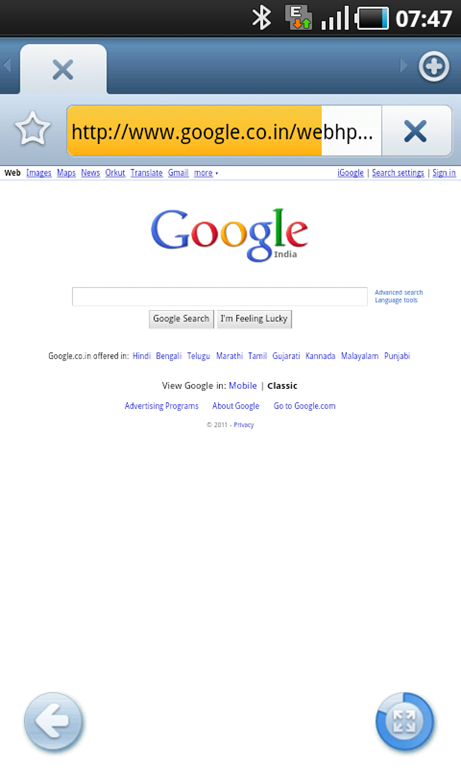 Just take a look at the different browsers shown above. If you love options, then Android is the place you should in. All of them support effortless pinch to zoom, gestures, tabs, social sharing and flash player 10. 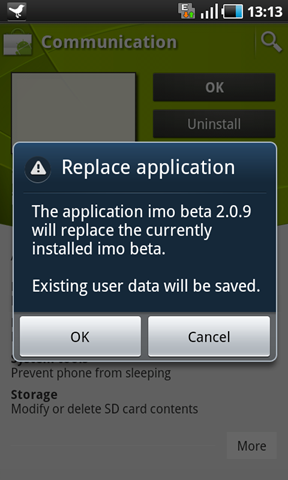 If compared to Nokia\ Symbian^3, the screenshot below is enough to make the Nokia Symbian Developers facepalm. 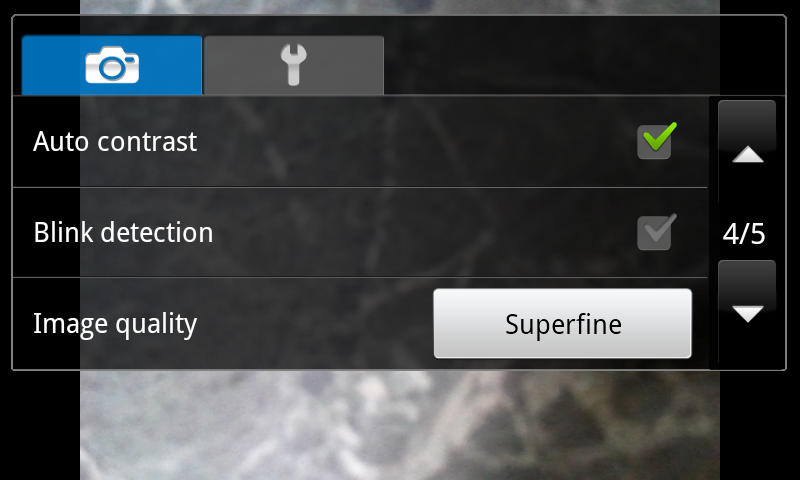 Split screen input, ah. 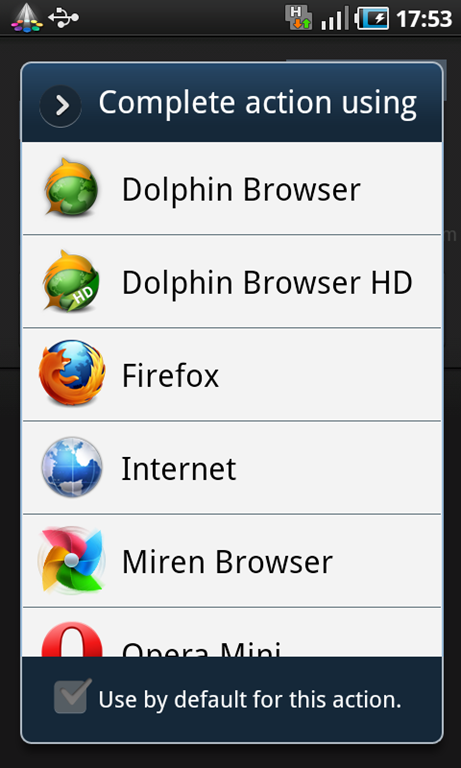 My personal favourite been xScope and Miren, for their Google Chrome like UI. 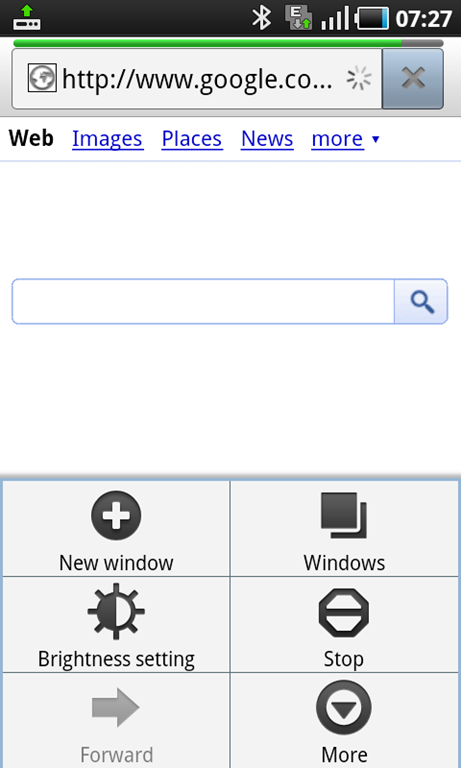 Though there is no mobile browser support for auto translation like the way the original Chrome browser does on PC. 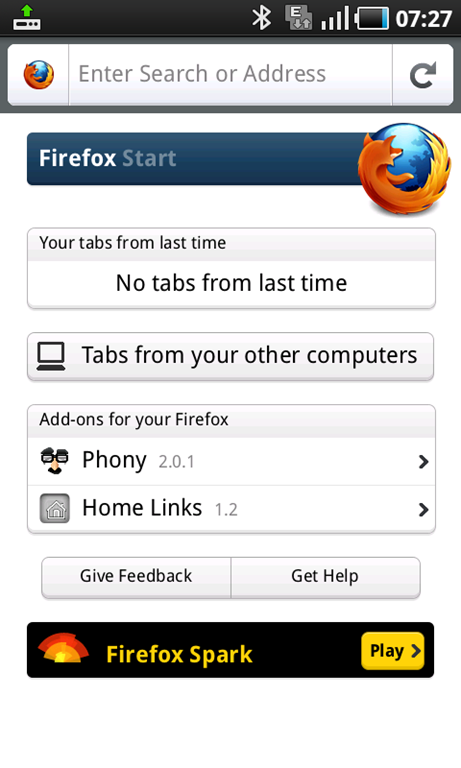 I know there are apps for that, but I wish to have the same built within the browser itself. Yes! 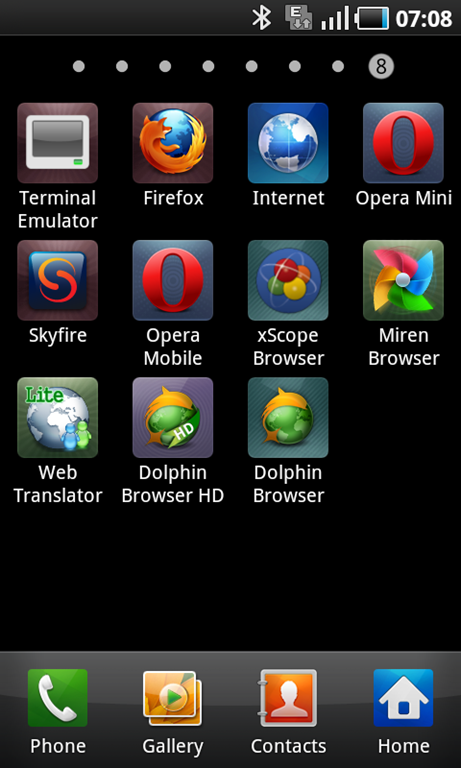 I very much remember the MicroB Browser of Maemo, but on Android, it was hard to choose as almost all of htem support as many features of HTML 5 etc that Symbian is not going to include (as of now) with even Anna or the future updates. When it comes to iOS, then it’s comparatively better but lack of Flash support there is enough to keep you convinced to stay on Android if you are the web browsing guy. And even from the Tablet point of view, (Galaxy Tab 10.1 Vs iPad2) if you think that Flash Support is not a big deal, then think again as I watched almost half of the Cricket World Cup Final on my Galaxy S via ESPN, thanks to Flash 10 support and the default Android browser. Not going into details of individual browsers, but I can assure that you would never get disappointed by even the native one when it comes to support and features and rest of the browsers out there only go beyond it, for some extra points maybe. 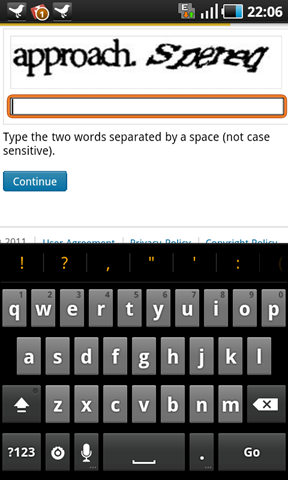 If you’d ask me to rate this section, the Android Browsing experience scores higher than 100%. 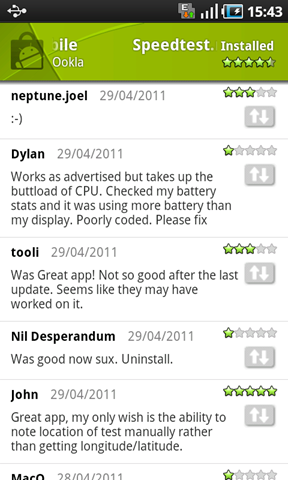 Long time Nokia users have always been speaking about the lack of apps and ranting about the same. When others talk about their advanced stores and millions of apps, then Nokia asks you what’s great in a store? 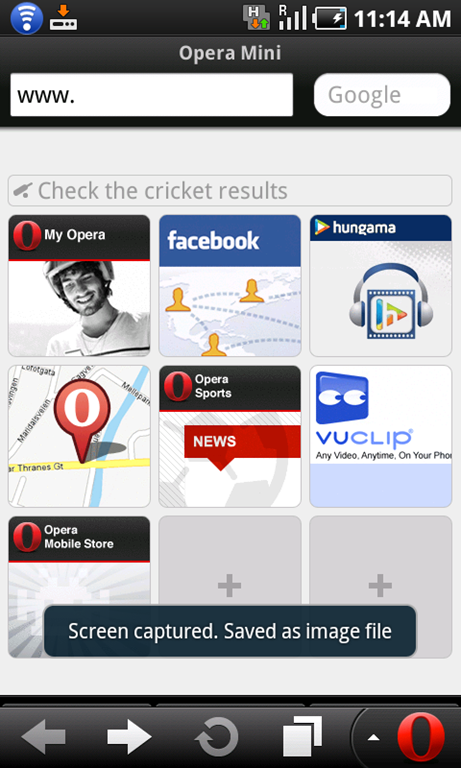 A Nokia user can also go into the Ovi Store and buy/download apps like other platforms, right? There’s much more to the experience! There is much more about these apps, app stores and numbers. There might be ways to avoid the App mania like my friend Ashutosh discussed here, but that doesn’t reduce the relevance of Apps. One needs variety of apps for choices, services, innovative competition among apps\devs and sharing inter and intra ways to keep the experience always live and fresh. Being the most liberal App database out there, the Android market has its own set of advantages and disadvantages for geeks, but for n00bs, the only one fact that’d actually matter is that they never run out of choices. 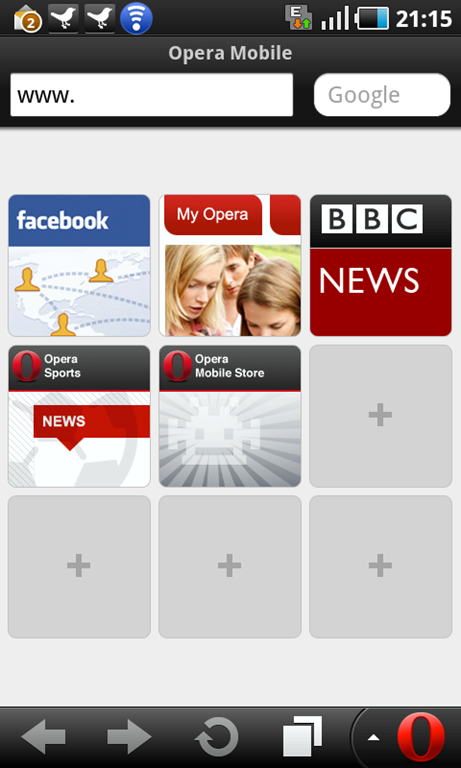 Loads of apps will always be there to explore which will keep your fingers engaged in tapping and pinching your device. And, looking from multiple dimensions, it’s not about the numbers from any angle but about the way apps get created, approved, delivered, downloaded/purchased, updated and notified. It’s a cycle that works efficiently delivering the perfect experience possible on the device. Smooth and enjoyable! I will talk a little about the possible reasons behind these many apps, but let’s see how the Android Market experience would be for a Layman. 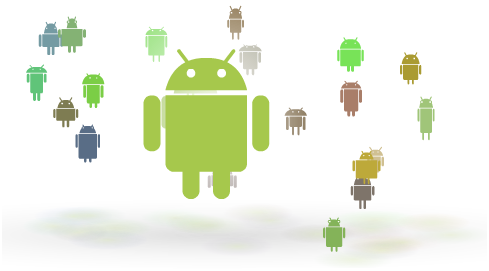 I will discuss about some of the excellent points about the Android Market here. Let’s first see what a user gets when he taps on the Market icon in his device. The Market authenticates with the same Google account you’d synced with while setting up your phone and stores all the info related to apps there only. It’s really interesting to note that if you switch the device and login via the same Google Account, all the earlier downloaded apps(free and paid) get listed there automatically and you can start downloading them in the easiest way possible. Google has been the synonym for search on the Internet for quite a long time and the searching of apps via Android market continues with the same simplicity and elegance. Just like the overall OS, the interface is really fluid and even searching and reading about apps feels like some treat at times. Anything you’d expect from a world class App market, seems to be more or less right in place here. Smooth kinetic scrolling, instant suggestions while searching, split portrait qwerty, listing of prices in regional currency, rating, reviews, relevant apps, reporting. Woah! Especially on higher resolution Androids, like the Galaxy S, it’s always an engaging and rich experience to browse the new apps and spend some time in the market. The above screen summarizes and explains what you’d see in the first screen of the market with some of the promoted apps placed for the show. While the easiest way could be using the search function, you can go via the traditional route of Application Categories. All the categories further gets divided into three subcategories,Top paid, Top free and Just in. Simple though useful. Now, individual App pages come with a lot of richness about content inside (Thanks to the high screen resolution as well). 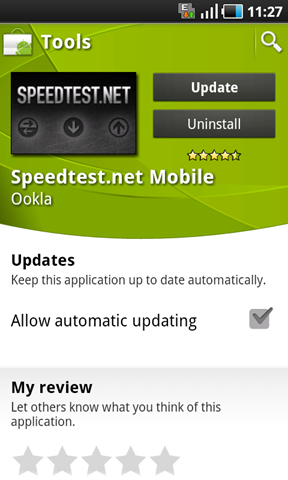 You can install, update or uninstall the app from the App page itself. Moreover, there is an automatic updating option as well that will keep your app updated whenever any update arrives from the developer (though it didn’t work out well due to manual updates at many times and other issues). 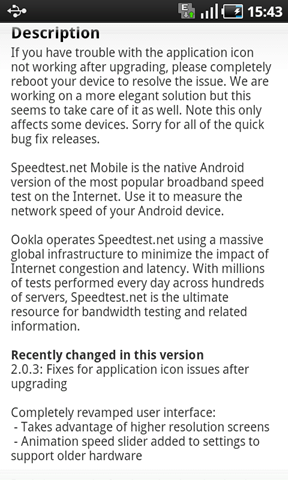 You get the detailed descriptions that also keeps itself updated with the change log, whenever any update comes (strangely, it doesn’t reflect the last update date, while the web version of the market does). 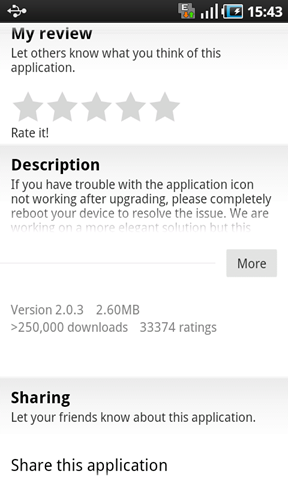 Not only the version number and size, but the Android market isn’t any bit shy about the number of downloads for individual app and the number of ratings. 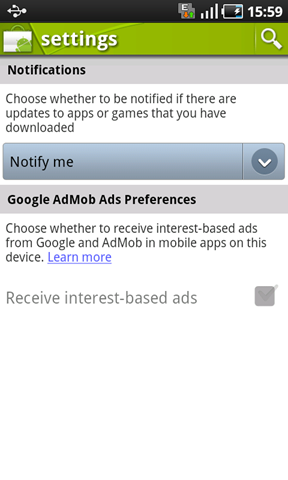 Option of sharing the app page with the world via twitter, facebook or mail makes it more easy to get marketed itself. 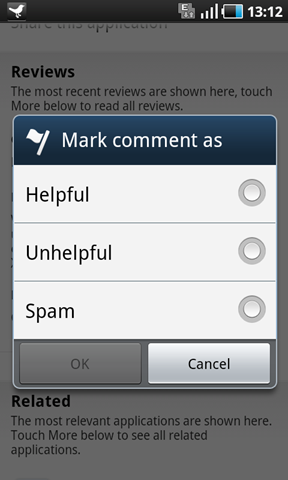 One can easily read user reviews (all the time with butter like kinetic scrolling) and also can mark them Helpful, Unhelpful or Spam based on own experience. 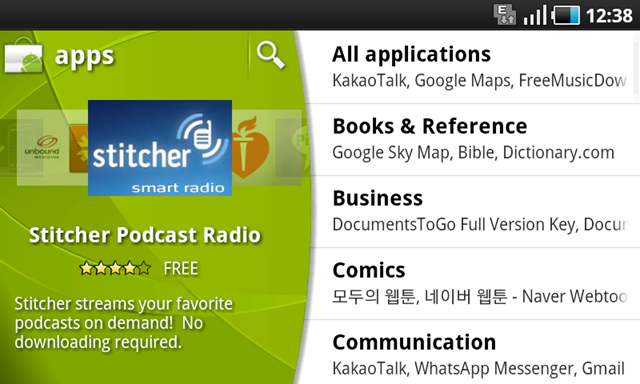 Also, there is a section showcasing the related apps and Developer Info as well. 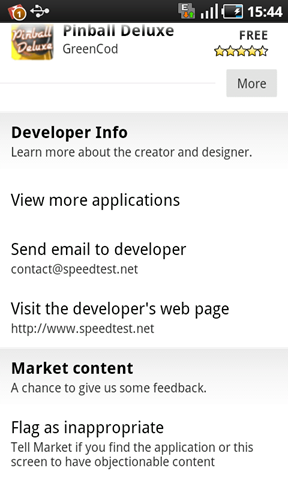 The developer info section is a quite a useful feature for consumers and app makers. This not only makes it easy to contact a developer directly, but also helps you to reach to the other apps published by the same publisher. A win-win situation for both the sides. When you check out the market settings, it might look like a pretty small one initially, but how big it is, you’d come to know in a few days, when your installed apps start showing update notifications and do everything themselves. Believe me, if you are thinking that only Gravity updates come fast, you’d need to think again. If you are following me on twitter @nkumar_ , you must be used to such updates on a daily basis because I keep updating them daily. 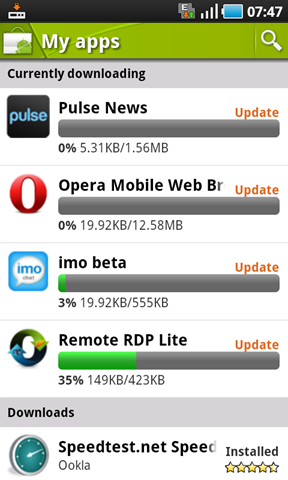 And yes, literally updates are done on a daily basis. On Android, I rarely seen any developer publishing their apps outside the market or sending updates via any other channel. This shows how easy and rapid the publishing tools are and also the approval mechanism. A consumer no longer depends upon tech sites or blogs to know if there is an app update available for his app, one just needs a working data connection (as I’d mentioned that it was mandatory for Android). 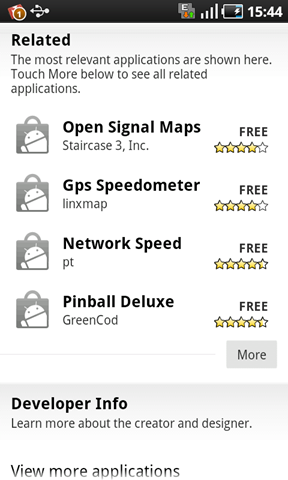 The other good thing about Android Market is the consistency. Somehow I hated the way, the iOS app store throws you outside, when you tap on install for any app. 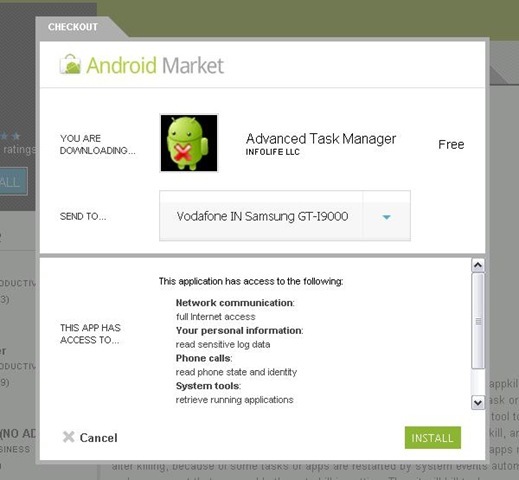 Android Market and Ovi Store work in similar ways in this regard as they still keep you in the Store, allowing you to browse other applications while the one you chose downloads simultaneously in the background. 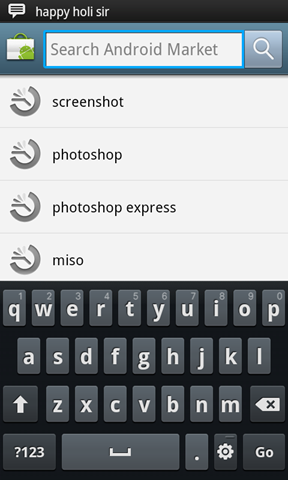 This helps users for grabbing more and more apps in one go. Like other Google Services, there should be no doubt about the efficiency and performance of Android Market’s web version. 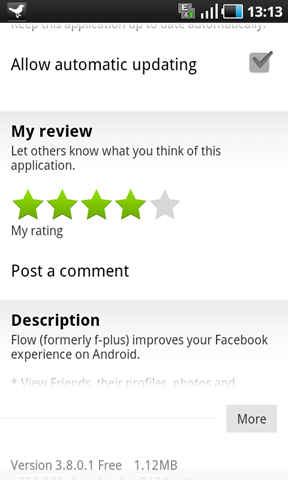 Easy to search the apps, read reviews and even know when was the last time the app got updated. 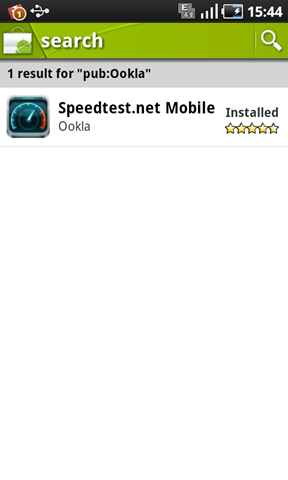 You choose an app to install and in place of sending a link like how the Ovi Store does, it connects you with your device itself (shows name of devices and service provider) and starts downloading there. 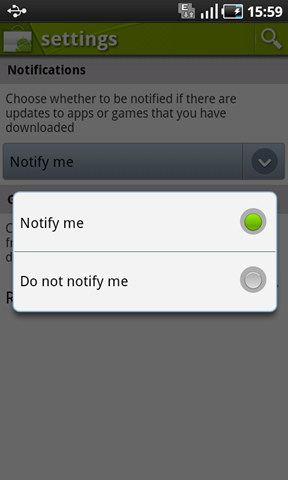 No SMS to your device like Symbian nor any need to click any link. Just press install and it will soon appear in your notification bar as being downloaded. No interruption to whatever you might be doing, no need of data cable or any installation on PC. 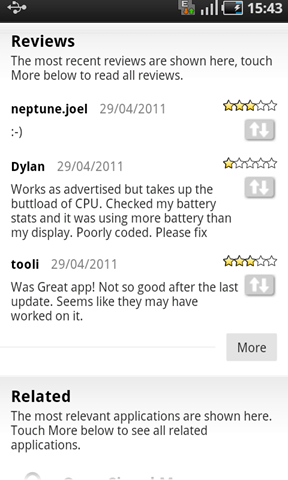 While one would be quite satisfied with the performance, there is one area of big complaint from Indian users side. It essentially makes use of your mobile connection only (wifi, 3G, EDGE) than downloading the apps on computer itself. In India, where Wifi is still rare, 3G costs a bomb and EDGE simply insufficient for downloading files over 100mb in real time, this is really an issue. Though I know the technical reasons for this design decision and also know the fact that Android is not doing this alone, I still wish if things were the other way around and it was possible to download apps officially via PC connection or at least via reverse USB tethering like how HTC Sense has made it a default feature in all Androids. 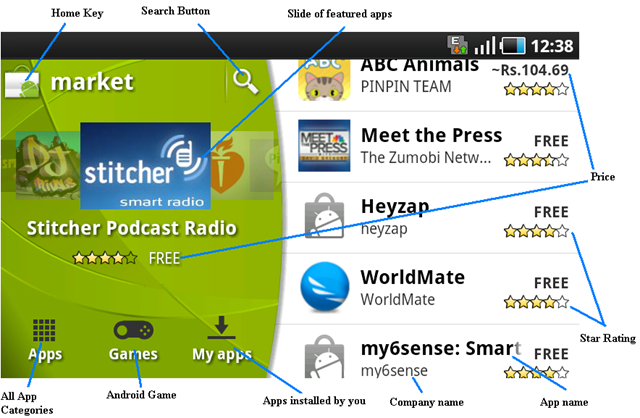 Though geeks should note that this is not the case that Market is the only way to get the apps as there are tons of .apk files available on the internet which can be downloaded from many sources and unlike Symbian, I never found any need of signing apps. It was a very rightly made statement that "With the great powers, comes great responsibilities". And the same seems to be happening with Android Market as of now. 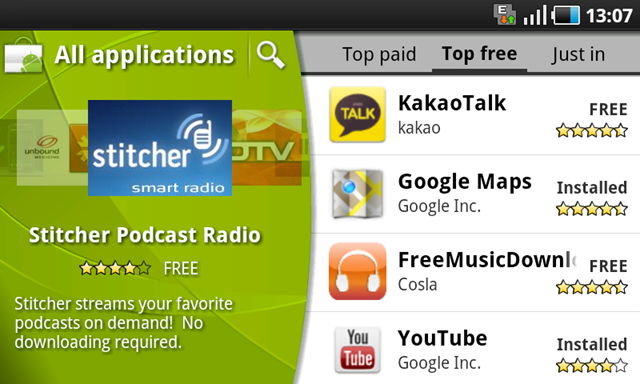 The apps in the Android market get an easier entry than Apple or Nokia Stores. The faster process of approval helps in gaining momentum, but loosens the grip on QA. 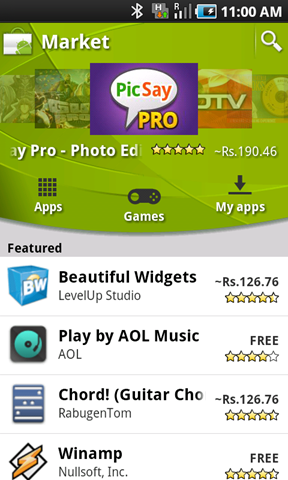 Similarly Android Market fails miserably on the regional content delivery (Ovi Store rocks on that matter). 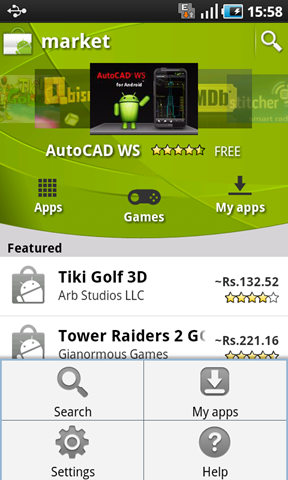 It’s common to see Chinese Content in Indian Android Market and so with other unknown languages. I think I said it, Android Market is a bit too liberal, while it’s the strength of it, same is its weakness. So here I need to close the third part of review as it’s getting a bit too heavy for my live writer. Thought to cover the Apps in this one only but it looks like it has already gone too long and too heavy. Will cover that in the next post. At the end, I would want to thank you all for staying patient and reading through these marathon reviews about a device that’s a bit old now. I really want to give you all whatever you might wanna know, but that needs your feedback. You can write to me on nitish@nitishkumar.net and/or follow me on twitter @nkumar_, I reply to each and every mention and email which I receive. A friend of mine owns it, n u r right he keeps complaining about the relevency of the applications he downloads and often is fooled by the headers. Thanks Subho, but the same is with all of the platforms as of now. I have seen iOS, Symbian, BB and Android, while I will admit that Android is way too liberal to allow apps without that high level of QA, Ovi Store is also filled with feed reading kind of apps. This is the first time I saw someone writing full ‘etcetera’. Ok now review, very extensive & honest. Appreciate your hard work. I should direct the thanks to someone else who took care of some editing part. Thanks for taking full read. Good work by that someone. Lucky you!! 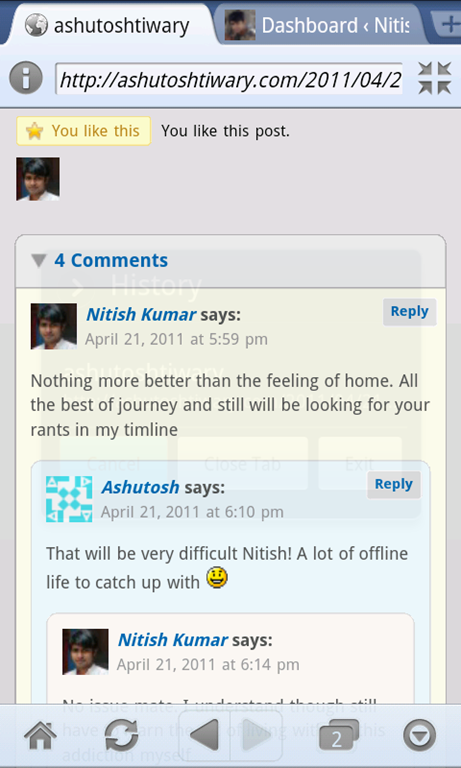 Hey Nitish, very good review continues ! 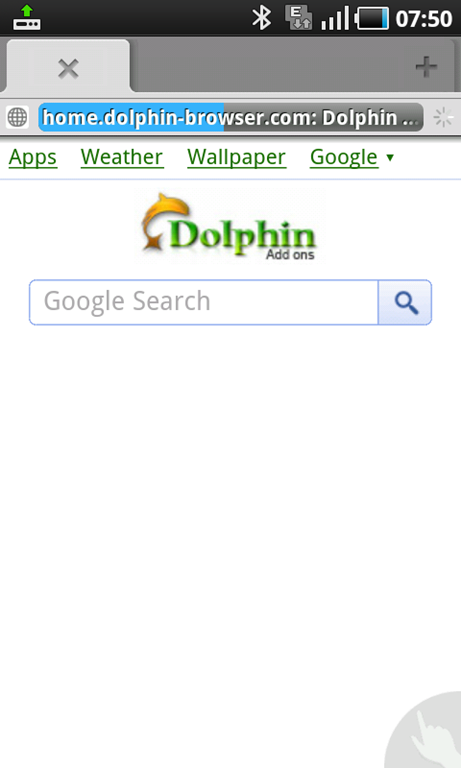 Best I have seen ever on SGS/Android. Keep it up. After checking your few tweets, I thought you are losing layman focus, but your proved me wrong. 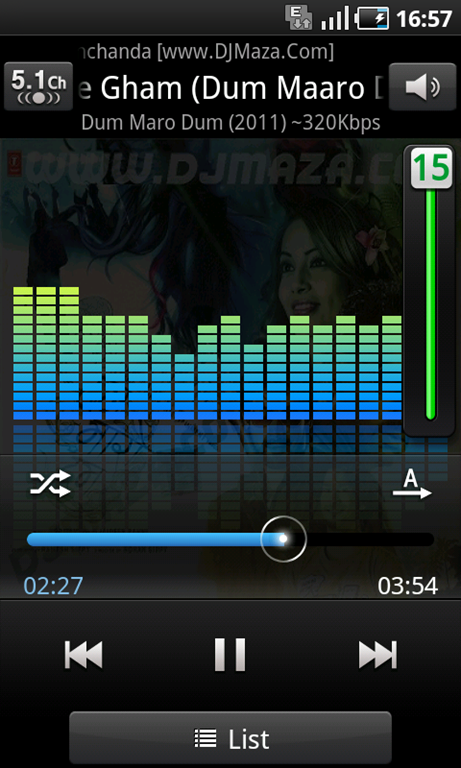 Rocking ! Very detailed explnalation on the phone 🙂 Thanks to Nitish … Can you help me out for Ubuntu installation on this. Do you have any clear steps to install..
find an expert personal injury lawyer to claim damages. of turbocharged engines that helps deliver better performance but Encore needs more than that. all of a sudden no Florida. 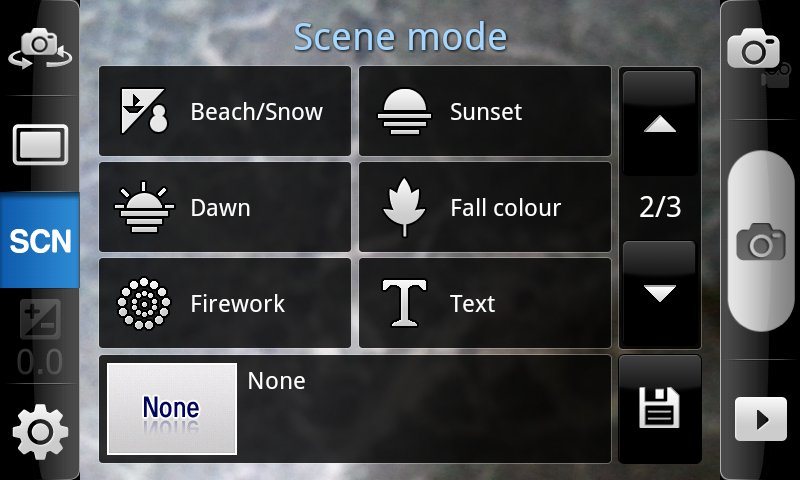 It will also display climate functions operated by the manual controls below. and take place on oval tracks having all left turns. all the automotive shops for their regular maintenance. Original Equipment Manufacturer Tail Lights: These are fitted at the back of the car and can be colored matched with the car. won a number of awards for safety and quality. certainly enough room not to feel claustrophobic. Have a look at out speed challenges like the all-new Lamborghini Aventador. (which come in handy for items such as dirty shoes), and a cargo net. has not been also horrible possibly. of your post’s to be precisely what I’m looking for. Does one offer guest writers to write content available for you? W rapidly, until anybody finds how you can dismantle these. before they go on stage. run from a stop to 60 mph will take nearly 10 seconds. A wide rpm range for maximum torque is a trait of turbocharged engines that helps deliver better performance but Encore needs more than that. They assure you of unparalleled service, luxury, and convenience in a choice of the best aircraft. for me to pay a quick visit this web page, it consists of valuable Information. practitioners of personal time management fail to grasp. An arrangement like this provides a number of benefits. to pick it up as well as create the association between the offered services and the destination in question. This means that through adding adventure to travel plans means getting dirtier, people are actually getting healthier. Chincoteague Island is the premier family vacation destination on the Eastern Shore of Virginia and the home of the world-famous. patterns. About 80% of Andalusians are grey or white, 15% are bay, and 5% are black. a majority of the Andalusian war horses. very wrong’just like a travel agency can be an ally to a hotel that it refers to, so The search engines are an ally to your website. android tablets is almost 33%. I’ll right away take hold of your rss as I can’t find your e-mail subscription hyperlink or newsletter service.